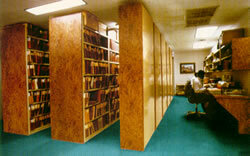 The impact of a Shelving System in library settings, more than any other application, can determine the overall feeling of an area. Darkened wood grains and muted colors can impart a sobering solemnity, while lighter finishes with contrasting accents can bring with them a highly contemporary quality. Traditional shelves can soften repetitive collections, while open construction and airy finishes can highlight individual volumes. Many benefits of RTI's diversity can be utilized in these areas. Sizing flexibility allows full floor-to-ceiling installations, wall-to-wall fit without gaps or fillers, and the ability to wrap corners and obstructions for a literal built-in finish. 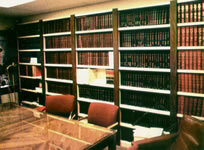 Shelf openings can be predetermined in 1" increments and a rear shelf deck can be added to allow viewing of titles when double stacking is desired. The most economical, all-steel construction can be incrementally augmented to allow highlighting of only the most visible attributes such as end panels or vertical facades without necessitating a universal increase in costs. Alternatively, total customization can be achieved through color-matched finishes, plastic laminate trims, hand finished woods in any available grain and patina. 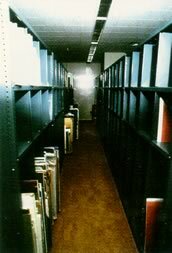 Whether your Library commands thousands of square feet or shares your available corridors, RTI can satisfy any aesthetic or budgetary requirement. 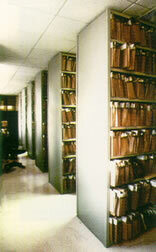 Whether you're planning a new File Room for countless legal records, reconfiguring a Mail Center serving hundreds of employees, or designating a small area for collating a once-a-year mailing, contemporary workplaces share a number of inescapable attributes: Restricted available space, the need for a workable environment where sheer capacity must be mitigated by accessibility and habitability, and the encompassing limitation of budgetary constraints. These restrictions coupled with the seemingly endless diversity of potential applications, is none-the-less easily manageable through the implementation of RTI's broad product range and planning abilities. The most straightforward Stockroom can benefit from our flexibility of sizes so that paper clips don't demand as much space as envelopes. A Mail Counter can serve a double purpose as a packing station or collating area by including overhead sorting bins, below counter storage, or a recessed scale compartment. A satellite copy center can become more functional with the simple addition of a 2 X 3 foot work counter capable of storing and sorting 100 reams of paper below its plastic laminate work surface. 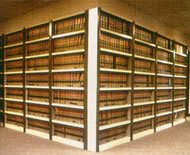 The seemingly minor addition of file supports, backstops or reference shelves can drastically transform the appearance and functionality of any filing area. Custom manufacturing can also accommodate any specific need from audio/video equipment and tape racks to the stringent demands of magnetic media. These and hundreds of other applications can not only be accommodated but maximized with the appropriate intermix of RTI's materials and expertise. While many installations can be easily categorized as Libraries, Mail Rooms and File Areas, which share basic parameters, many others demand a more comprehensive "from the ground up" approach. The true versatility of any storage system is judged by its ability to not only accommodate specialized requirements, but to be able to adapt and reconfigure so as to realize the same productivity and capacity improvements as with the more "mundane" applications. With a handful! of basic component types and the manufacturing ability to "size" these components, a virtually unlimited realm of constructions are available. While a basic storage concept may be sufficient, the ability to selectively implement components from other manufacturers as requirements demand yields the best result, rather than the inherent limitations of a single product line. Where, for example, movable shelving is indicated, the ability to choose from the best mechanical equipment while maintaining the flexibility of optimizing the storage units themselves often eliminates significant losses from the mobile manufacturers "stock" shelving. RTI's ability to couple our own unique construction with the best available auxiliary equipment guarantees an optimal installation. This equipment can range from simple storage cartons and parts bins, staircases and signholders to various mezzanine dockings, lockers, mobile storage systems and material handling equipment. RTI's ability to coherently interpret the actual requirements, specify and coordinate the appropriate solution, while still maintaining full manufacturer's control of the costs and materials that comprise the bulk of the installation finally allows "single sourcing" of an entire installation without the inherent shortcomings of either a finite product line or the additional costs of a third party supplier.